^ Markowitz, Eric. Meet 3 Start-ups Behind Apple's New Maps. 2012-06-12 [2012-12-16]. 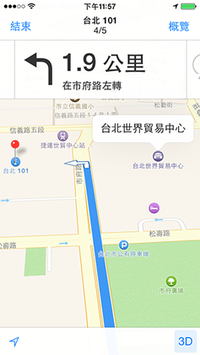 ^ 4.0 4.1 Apple Built Special Version of Maps for China. China Real Time Report. Wall Street Journal. 2012-09-26 [2012-11-16]. ^ Pogue, David. The iPhone Matches Most of Its Hype. The New York Times. 2007-06-27 [2012-09-26]. ^ Marshall, G. (21 September 2013). "Apple Maps: one year on". TechRadar. Retrieved 22 October 2015. ^ Cook. (28 September 2012). "Apple(Canada) - A letter from Tim Cook on Maps"
^ Arthur, C. (28 September 2012). "Apple Maps: Tim Cook says he is 'extremely sorry'". The Guardian. Retrieved 22 October 2015. ^ Satariano, A. (28 November 2012). "Apple's Cue Seeks Overhaul of Maps Amid Duel With Google". Bloomberg Businessweek. Retrieved 24 October 2015.